Canadice, Einset, Interlaken, Jupiter, and Thomcord grapes bear little resemblance to the blandly sweet red and green grapes that you find at most supermarkets. And unlike Concords, they don’t have pesky seeds. They’re complex, spicy, tart, and so full of flavor that they remind me why we use grapes to make wine. Their season is short, and I tend to bring home a basket of mixed grapes every week, and we snack on them. But sometimes my eyes are bigger than my stomach, and last week I realized I had grapes that were beginning to look at little raisiny on the vine. I used some to make spiced grape preserves, but I put the rest of them into this grape olive oil cake. There are maddeningly few recipes for using grapes like these out there. And since recipes for Concords involve going through the trouble of removing all of those obnoxious seeds, they tend to be fussy and involve slicing–and if you’ve ever gone to the trouble of slicing lots of grapes you know that they roll all over the place–or mashing and pulping and straining out the seeds and skins. I’m not one to shy away from complicated baking projects, but I wanted something that would put these grapes to use that would let them shine in their whole form and that wouldn’t be such a hassle. This grape olive oil cake was inspired by the flavors on a cheese plate. It’s rich with olive oil and ricotta cheese and has just a hint of rosemary. I know rosemary has a tendency to be overused, but it pairs beautifully with these flavors. And while I’d definitely call this cake dessert, it’s restrained on the sugar front. It’s the kind of dessert that flirts with the savory side. 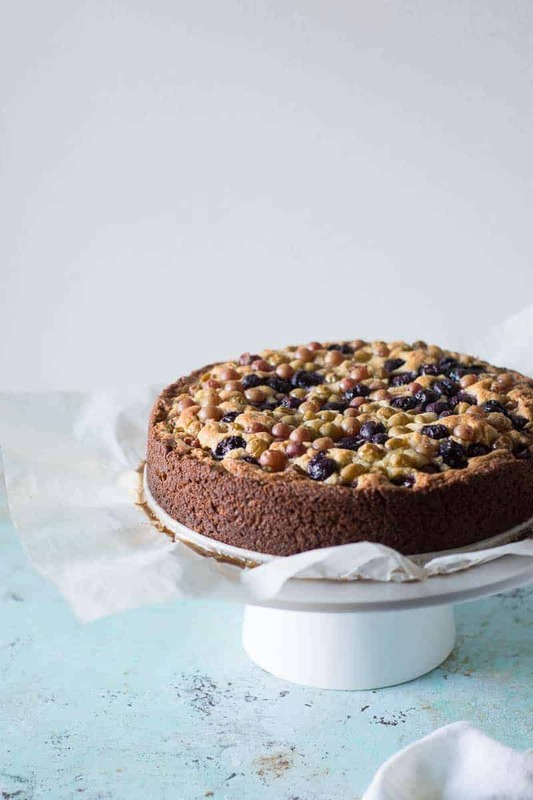 It’s probably not going to be popular with the kids, but if you’re the kind of grown-up who enjoys a little wine and a cheese plate, this grape olive oil cake is for you. The batter comes together in a few minutes. And with the beautiful olive oil and ricotta it’s incredibly moist. 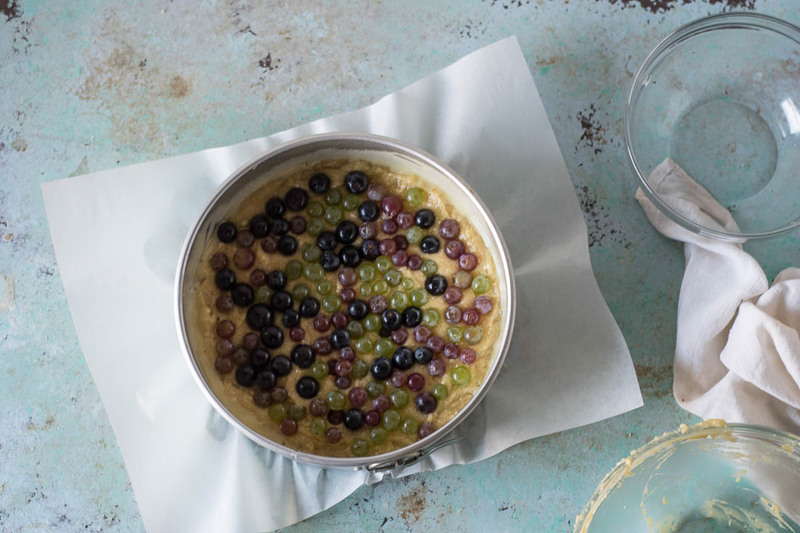 A springform pan gets lined with parchment paper, the batter gets spread evenly over the bottom, and the grapes get gently pressed into the top. It’s a lovely everyday sort of cake. Perfect with coffee or tea. And I’m sure it would be excellent with a dessert wine too. 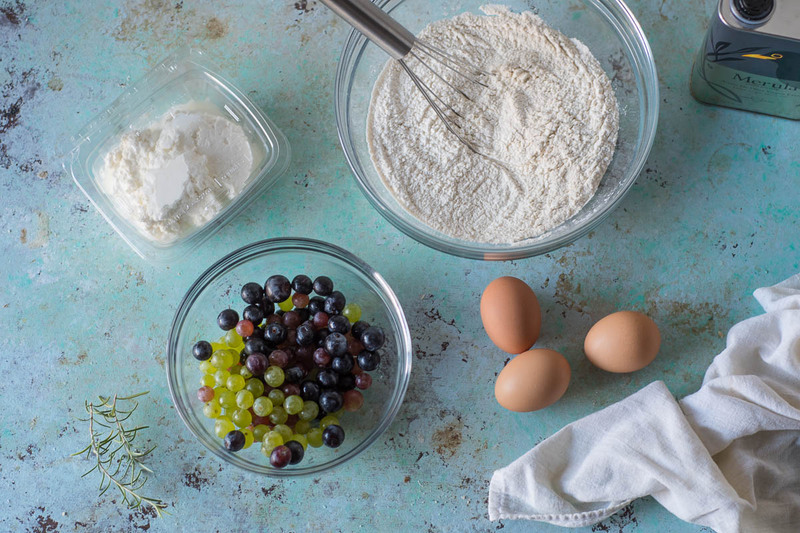 If you find yourself with too many delicious grapes, now you have something to bake with them. 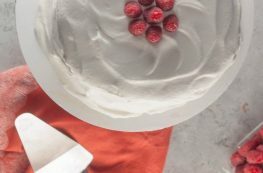 This cake is only mildly sweet--perfect for grown-ups looking for a simple rustic dessert. I wouldn't make this with standard green and red grapes--you want seedless grapes that are fragrant and flavorful. Any mix of Canadice, Einset, Interlaken, Jupiter, Mars, Thomcord or similar grapes will work beautifully. I like to use a fruity olive oil here--an aggressively peppery one would feel wrong. The ricotta adds a lovely richness, and the rosemary is subtle (you can leave it out if you want). I have a hunch this would be beautiful with about a 1/2 cup of ground walnuts or pinenuts added, and I might give that a try next time I make it. This works best in a 9-inch springform pan. Preheat oven to 350°F. Line a 9-inch springform pan with parchment paper (I do this by separating the sides and bottom, covering the bottom with the parchment leaving the overhang on the outside, then reclamping the sides around the parchment to hold it in place). Spray with nonstick spray. Add the flour, baking powder, and salt to a large mixing bowl and whisk until combined. Add the olive oil, eggs, ricotta, sugar, and rosemary to another large mixing bowl and whisk until thoroughly mixed. Add the wet ingredients to the dry ingredients and stir until just combined. The batter will be thick. 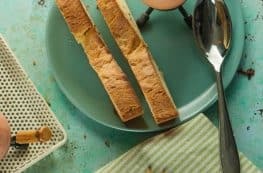 Spread the batter evenly in the springform pan with a silicone spatula. Spread the grapes over the top in an even layer--they should just about cover the cake--and gently press them about halfway into the batter to hold them in place. Bake for 60-65 minutes or until a toothpick inserted in the middle of the cake comes out clean. Let cool in the pan, then gently release and remove the sides and serve. oh man!!! I’m so jealous– I can’t find anything but the regular green, red, and black grapes.. I got concord grapes from a friend with grapevines, and made grape pie. It was delicious- but removing all the seeds was almost impossible! I wish I could find these grapes- this cake looks divine! Removing the seeds is such a pain! I hear that Thomcords (a seedless hybrid of Concords and Thompson grapes) are starting to be more widely distributed. Hopefully they’ll make it to your neck of the woods soon! Nice idea to go with a cheese plate. Very nice for brunch or after hours dinner date! Thanks. This is a gorgeous cake and such a great idea! I can totally picture this at home on a lovely cheese plate. You’re also making me crave some different grape varieties! I’ll have to track some down. I hope you find some–they’re totally worth it just to snack on. This looks delicious and WOW your pictures are amazing! Very pretty! 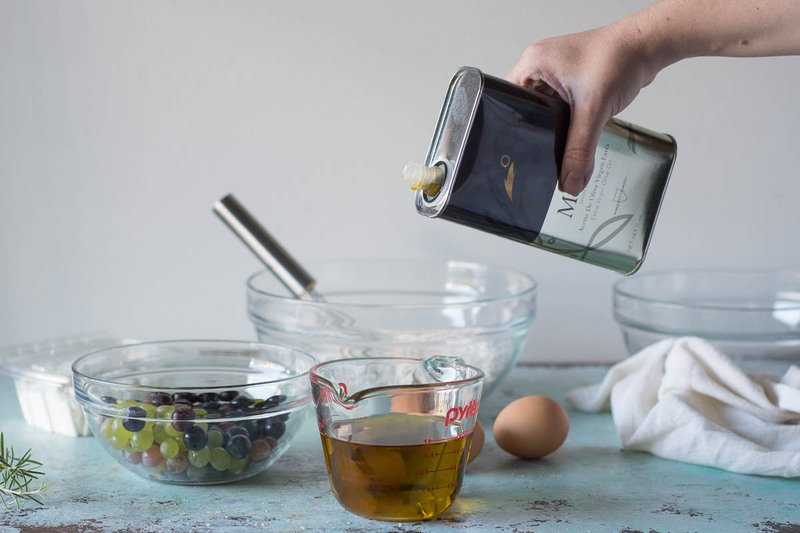 I have always wanted to try baking an olive oil cake as heard so many good thing about it! Your version sounds so good, booking marking for later. 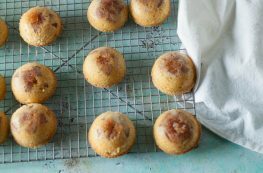 Olive oil cakes are so delicious! I love butter, but olive oil brings a different kind of richness to a cake. Hi Mary, after seeing your cake, I made it too! Made a couple of changes (less olive oil, as I’ve used our own, cold-pressed and very rich), and used apples instead of grapes. I reckon apricots would work fab as well.